Wandering Heroes of Ogre Gate is about virtuous heroes and magnificent swordplay, but the martial world they inhabit has a dark side. Grudges, hypocrisy and endless killing all feature prominently in play. The characters can be heroic, they can beat the bad guy and save the day. 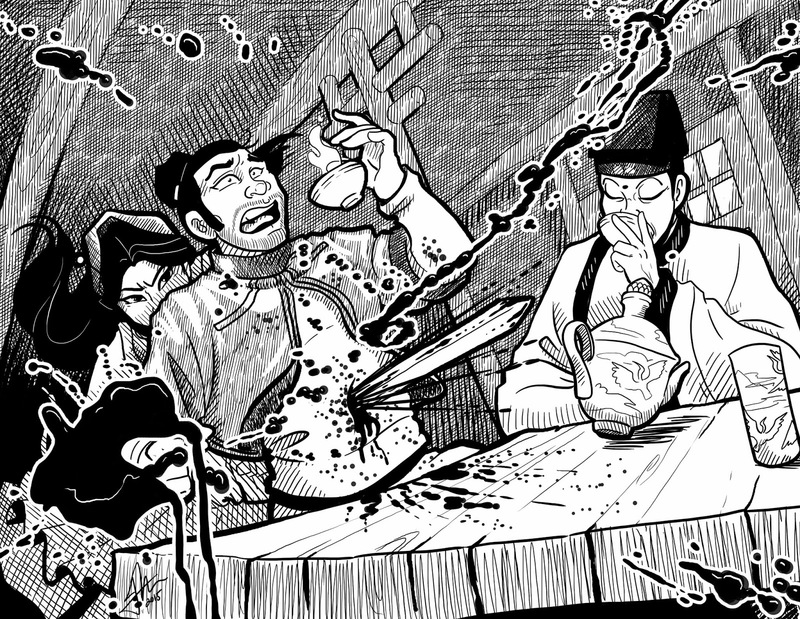 They cannot escape the bloody reality of the Jianghu where revenge is often a duty that leads to a cycle of death. And revenge is merely the most worthy aspect of its dark side. Crime, exploitation, greed, betrayal, and cruelty are are hidden there as well. In this respect, my wandering Heroes of Ogre Gate campaigns have something in common with my Crime Network campaigns. The warring and feuding between the sects, is not unlike the warring and feuding between the mafia families. This isn't to say they are the same. There are enormous differences but it can be helpful to draw on some of the play structures we used in Crime Network to create a solid Wandering Heroes of Ogre Gate campaign. This means it is helpful to have a sense of the ongoing conflicts between sects, knowing which ones are enemies and allies. But it also means the players' own actions, even when well intentioned, can come back to haunt them. Every death has some impact on the world. Some will produce grudges that result in more conflict down the road. This could me immediate, as in the case of a brother who seeks the avenge the death of a sibling within weeks of it occurring. This could be more long term, perhaps taking years as the child of a fallen foe grows into adulthood before striving for vengeance. Grudges also have a way of making themselves known when you don't expect it. Grudges often matter a great deal to those seeking them but are meaningless to those on the receiving end. Killing is like breathing air in the martial world and many only experience pangs of remorse when the blade of an enemy's lover strikes them through the back. For this reason, not only are GMs encouraged to think about grudges following any kill, there are also Grudge tables for encounters.